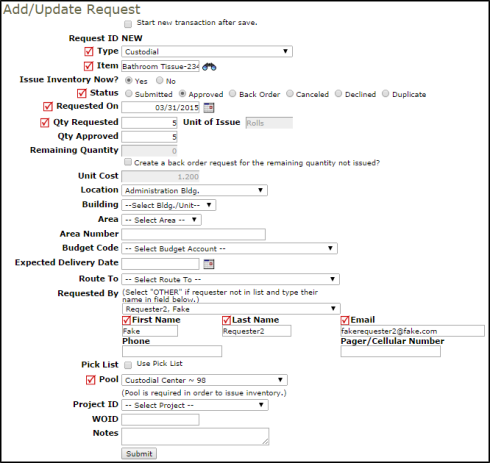 Inventory requests will often be entered by your requesters through the MyFacilityDude request portal, but you may need to enter a request for another user or enter a request for approval. You can enter a request transaction and issue the inventory in the same time. Required fields are indicated by a red check box . Click on the Requests link in the Transactions section of the home page. From the My Requests Transactions list, click on the + Add New Request link on the right side of the list. Select if you would like to Issue the Inventory Now. Select the Status for the request. If you are issuing the inventory now, the system will automatically select Approved. Select the Requested On Date. Enter the Qty Requested. If you are issuing the item, enter the Quantity Approved. If you are not able to fulfill the entire request, you can create a back order request for the remaining quantity not issued by checking the box. Enter the Location, Bldg./Unit, Area, Area Number, and Budget Code information as necessary. Enter an Expected Delivery Date. If this request needs to be routed to another user for approval, select their name from the Route To drop down list. Enter the contact information for the user that requested these items by selecting their name under Requested By. If you are issuing the inventory now, you can submit it to a Pick List by checking the box. You will then be able to select an existing pick list or create a new one. Select the Pool that the item is being issued from. This is only required if you are issuing the inventory now. Enter a Project ID if needed. Enter the WOID if this request is tied to a work order.